It is a common practice to select a material for a product but in the case of the gear box it has special attention as it will decide the life, cost, weight and over all dimensions of the product. 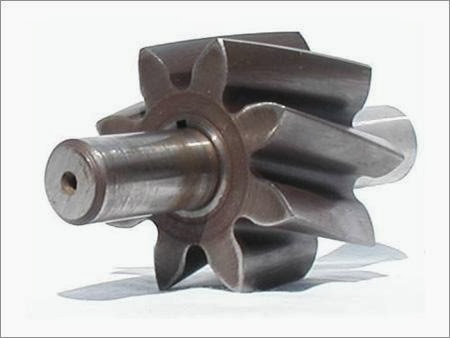 In gear box special attention is required for the gear material as they are main component the will be manufactured and they are the one under high load due to which they will face high wear and tear. Material selection process of any product consists of simply evaluating the material available for that product based on the mechanical properties, manufacturing properties, environmental aspect and economic conditions. In this section elastic limit defines the ability of the material to take load means how much load or stresses a material can take before it plastically deform. In the case of gears plastic deformation of gear will make gear use less as gear teeth profile in very important for proper power transfer. In order to get the best gear box Elastic limit of the selected material should be as high as possible. Elastic limit of all four materials in mention above according to that alloy steel is on first place due to highest value of Elastic limit followed by Medium carbon steel, aluminum alloy and at last the ductile cast iron. Density is very important mechanical property in this selection process as it defines the total weight of the product. In order to get the best gear box density of the selected material should be as low as possible. Density of all four materials in mention above according to that aluminum alloy is at the first position with the lowest density followed by the ductile cast iron at second and medium cast steel and alloy steel at last position. Hardness is the property which enables material to resist the change in its shape in the case of any external force or stress applied in it. It is very important mechanical property in the case of gear designing as it will define the ability of gear to resist the external loads to main train its proper shape. In order to get the best gear box hardness of the selected material should be as high as possible. Hardness of all four materials in mention above according to that alloy steel is the at the first position due to highest value of hardness followed by Medium carbon steel, ductile cast iron and at last the aluminum alloy. Fatigue strength of the material is its ability to resist against the fatigue loading when a fluctuating load is applied. In the case of gear designing t is very important property because gear will be under fatigue loading due to the central lathe operation procedure and gear box usual loading process. . In order to get the best gear box fatigue resistance of the selected material should be as high as possible. Fatigue resistance of all four materials in mention above according to that alloy steel is the at the first position due to highest value of fatigue resistance followed by Medium carbon steel, ductile cast iron and at last the aluminum alloy. Fracture toughness on any material will define its ability to resist the propagation of cracks in the material in the case if there is any defect in the material or final product produce by the manufacturing process. . In order to get the best gear box Fracture toughness of the selected material should be as high as possible. Fracture toughness of all four materials in mention above according to that aluminum alloy and Ductile Cast Iron is the at the first position due to highest value of fatigue resistance followed by Alloy Steel and Medium carbon steel. Manufacturing properties of any material are those properties which influence the manufacturing process of that material. Those manufacturing properties are machinability and cast-ability; machinability will define how easy it is to machine a certain material and cast-ability will define how easy it is to cast a certain material. For the low manufacturing cost selected material should have good machinability and cast-ability. All the four selected for material has good cast-ability but machinability is inversely proportional to the strength of the material. From the four selected materials ductile cast iron will have the best machinability followed by the aluminum alloy, medium carbon steel and at last alloy steel. Environmental aspects of any material are those aspects which shown the effect made by the use of that material on the environment. Embodied energy, CO2 foot print and recyclability are the factor which decides the environmental effect associated with material. Embodied energy is the energy associated with the extraction, manufacturing, transportation and decomposition of the material. In order to get the best gear material, embodied energy of the selected material should be as low as possible. Embodied energy of all four materials in mention above according to that ductile cast iron is on first place due to lowest value of embodied energy followed by Medium carbon steel, alloy steel and at last the aluminum alloy. CO2 foot prints show the amount of CO2 any material will release during its life type. In order to get the best gear material, CO2 foot prints of the selected material should be as low as possible. CO2 foot prints of all four materials in mention above according to that ductile cast iron is on first place due to lowest value of CO2 foot prints energy followed by Medium carbon steel, alloy steel and at last the aluminum alloy. Recyclability is the property which defines weather a material can be recycled or not. Economic aspect of material involves the cost of the material which will influence the cost of the final product. In order to get the best gear material, cost of the selected material should be as low as possible. Cost of all four materials in mention above according to that alloy steel is on first place due to lowest value of cost followed by Medium carbon steel, aluminum alloy and at last the ductile cast iron. From all the discussion made above it is clear that alloy steel is the best material for the gears because it has highest value of elastic limit, fracture toughness, hardness and fatigue loading. Along with this it has moderate values of environmental aspects and lowest cost of material.